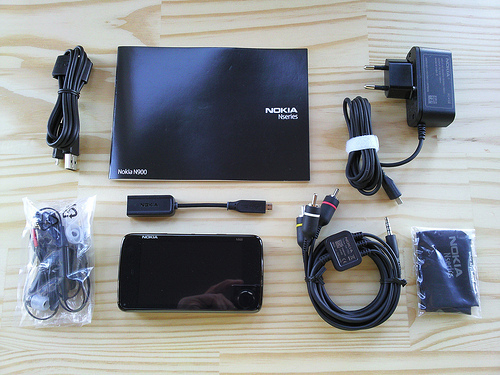 The N900 is the first phone from Nokia based on the Maemo Platform. Nokia has expressed their intentions to use Maemo in high-end phones. 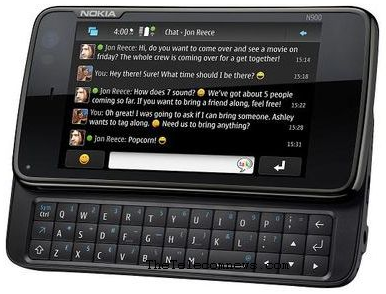 The Nokia N900 is a Touchscreen, full QWERTY slider phone and one of most talked about members of the N-Series recently. The phone gives us some pretty specs including powerful ARM Cortex-A8 600MHz Processor with 256 MB of RAM and a 3.5 inch 800×480 pixel resistive touchscreen display. § 32GB inbuilt memory plus micro SD slot. In addition to the above we will be also getting a converter plug for old nokia chargers . There’s no memory card / extra stylus / carry case in the retail package. N 900 is a touchscreen phone with a slide-out QWERTY keypad and it’s certainly big when you compare the N900 to other devices such as Nokia E72 or the iPhone . It felt comfortable to grip. We have no complaints about the placement of controls on the phone except for the weird placement of the hardware-unlock key on the right. It’s not the most pocketable phone out there but it still fits in your pocket. On the right side of the screen ,it appears NOKIA and N900 on the left. The main highlight of this phone is that, it doesn’t have an physical buttons in the front, not even call and hang-up keys. Although the phone is designed to be used in the landscape mode for the most part , the phone functionality needs to be used in portrait mode as the earpiece , proximity sensor and video calling camera are present on the top when the phone is used in portrait mode. We will also fine an notification light which can toggle between white, yellow and blue. There is a speaker on either side of the phone which justifies the entertainment capability of the device. On the left you would find the micro USB port which is used for both charging and PC connectivity. On the right is the hardware unlock key, 3.5 mm audio jack which also serves as a TV-out. We can find the stylus on the bottom part of the mobile. Volume rocker key, power button and the camera key are on the top part of the phone. On the rear sits the 5 Megapixel Camera surrounded by a kick stand. 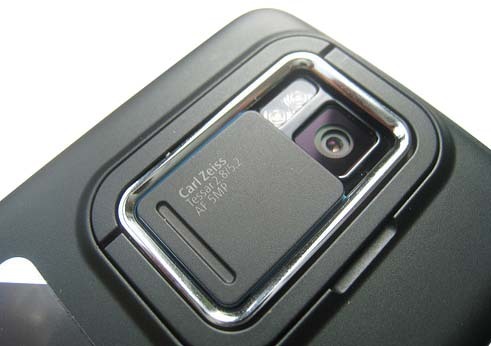 The camera shutter encloses the lens and the dual LED flash. The micro SD card slot is beneath the real panel which houses the battery and SIM card. The phone is designed to be used mainly in landscape mode and widescreen display. The 800×480 display is crisp and colors are reproduced quite well. Although the phone uses a resistive touchscreen, it’s very responsive and finger friendly. The keyboard is made up of 3 rows and the keys provide good feedback. But since the long press for numbers was not there at the time of this review, its bit hard to use. But the keyboard is powerful as there are tons of a keyboard shortcuts available out of the box. The device comes with 32 GB of inbuilt memory and has a micro SD slot which supports up to 16GB cards. The 1320 mAh battery on the device practically lasts for a day and half of light use and just about a day for heavy use. As with all phones it lasts longer over Wi-Fi compared to 3G / EDGE. The spec sheets don’t indicate battery life .At Nokia World , we heard that battery life was linked to user behavior and the device was built to last a day for average use. We don’t complain about the battery life but a 1500 mAh battery would have given that extra run time ! And one tip , you don’t have wait for the battery to go empty before charging the device. Charge it when the battery indicator is at about 50% and its charges faster. The Camera does take some great pictures and the fixed focus video recording which enables macro video recording is cool. But sadly the camera application is a bit slow. You might actually miss the moment in the process of capturing. The sharing plugins like pixelpipe make photo sharing and blogging a piece of cake. You can even email multiple photos and upload them in a jiffy. So we can conclude that, nokia N900 is a great phone which will help the buyer in all possible ways. She/he will be satisfied, when they use this blasting phone. This is not for the average consumer but a geeky crowd. If you are one of those geeks you won’t be disappointed. 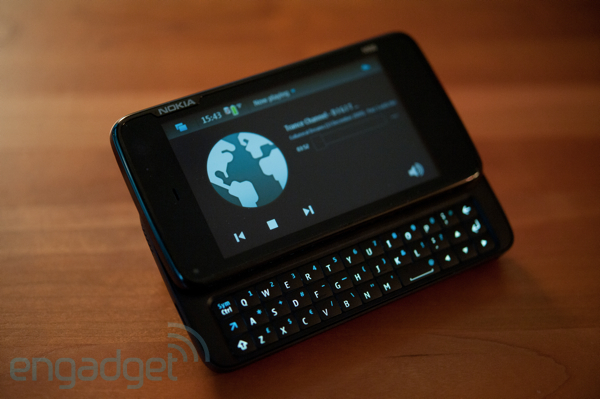 And if you are a fan of Open Source the N900 is for you! Although the N900 lacks in a few areas, it’s pretty powerful in some areas. It’s the first phone based on the Maemo platform and it’s obviously not complete. Maemo is a new ray hope for Nokia and the N900 is a live example of that hope. You may want to experience it or wait for the next device. VERY NICE MR.SREENATH . I LIKED IT. GOOD JOB.WISHING ALL THE VERY BEST FOR UR FUTURE AND UR BLOGSPOT. Good Post. As far as I know, this phone was released in 2009 and Nokia has stopped production long time ago. I am also interested in this phone. Did you buy this phone recently? Can you tell me the shop name? i think that now the nokia's famous phone is nokia n900. i did'nt buy this phone, but i think every mobile shop have this phone, and where is your home?